This guest post was written by Miles Currie. Miles is currently a post-baccalaureate researcher studying Type Ia supernova cosmology. This post represents Miles’ views and not the views of his employer. Many graduate students rely on a yearly stipend earned through fellowships, research assistantships, teaching assistantships, or a combination of the three. This stipend can vary based on institution and usually falls between the $20k and $30k range . Along with a yearly stipend, many graduate students, especially in STEM, have their yearly tuition waived by the institution so the student may focus on their academic responsibilities rather than worrying about taking out loans or working a second job. This along with the stipend is designed to help the student live adequately. Under the current tax codes, only the stipend is subject to Federal income taxes. The current tax regulations dictate that a graduate student’s yearly stipend is treated no differently than income from any other job in the workforce . The taxes owed are calculated from tax brackets (see Table 1). For example, if a single graduate student’s income is a stipend of $25,000 and the standard deduction and a personal exemption are taken ($6,350 and $4,050, respectively), this leaves the student with a taxable income of $14,600. Of this taxable income, the first $9,325 is subject to a 10% tax and the next $5,275 is subject to a 15% tax, bringing the total taxes owed to 0.10*($9,325) + 0.15*($5,275) = $1,723.75. Note that this tax calculation does not take the student’s tuition waiver into account, which is not considered taxable income under the current law. On November 2, members of congress released a proposed tax plan which removes the tax exempt status of tuition waivers from the current law . In addition to this, new tax brackets are outlined (see Table 2), the standard deduction increases to $12,200, and personal exemptions are removed. In this proposed law, if a graduate student’s annual stipend amounts to $25,000 and their tuition is $40,000, their total income is $65,000. After the standard deduction (untaxed) is taken, this brings their total taxable income to $52,800. Using Table 2, the total amount owed in federal taxes is 0.12*($45,000) + 0.25*($52,800-$45,000) = $7,350. Figure 1: Comparison of federal taxes owed as a percentage of income with varying stipend amounts in the current (blue) and proposed (orange) tax laws. The amount paid in tuition is fixed at typical values of $40,000 for private schools and $15,000 for public schools. It is immediately obvious that the proposed tax plan will hurt graduate students in an enormous way. In our examples, the the graduate student’s federal taxes owed would nearly quadruple, increasing from 7% to 29% of the student’s total income. 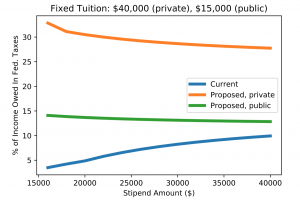 Other combinations of stipend and tuition amounts tell a similar story: Figure 1 shows how the federal taxes owed as a percentage of income varies with stipend amount with a tuition fixed at $40,000 (private) and $15,000 (public) in the current and proposed tax laws. Figure 2 shows how the federal taxes owed as a percentage of income varies with tuition amount with a fixed stipend of $25,000 in the current and proposed tax laws. It is important to note that private institutions may have the ability to restructure their programs to make tuition free, but it is unclear if public institutions will be able to do so. This restructuring may take some time to reach equilibrium and in the meantime, graduate students will suffer. Figure 2: Comparison of federal taxes owed as a percentage of income with varying tuition amounts in the current (blue) and proposed (orange) tax laws. 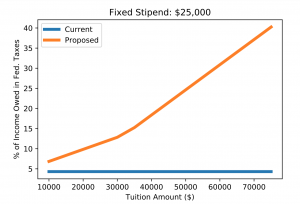 The stipend amount is fixed at $25,000, which is near the median for graduate institutions. The current tax law is not a function of tuition, therefore it remains a horizontal line. Although the effects on graduate students are immediately obvious, they have the potential to propagate throughout both academia and industry. With the substantial hike in taxes owed, many graduate students will be unable to live on their stipends alone and will be forced to take out loans, work second jobs when possible (often graduate students are not allowed to do this), or drop out of their program outright. Much of the research done in academia relies on graduate students to run analyses, develop experiments, and write up results. The shortage of graduate students’ availability will undoubtedly hinder the progress of research in academia and will subsequently have a negative effect on industry due to its heavy ties with academic research . The development of American technology will slow everywhere from Silicon Valley to the defense sector. The proposed tax laws will negatively affect graduate students directly and the propagating effects will be seen indirectly in both academic and industry research. This will prove to be unsustainable in the long run and action must be taken to prevent these tax hikes for graduate students. I encourage everyone reading this to call their representatives to express their concern. Calling is the most effective way to have your voice heard. I’d like to thank Georgia Tech PhD student Benjamin Ide for compiling much of the tax information used in this article. This was a huge help in getting me started. His original blog post can be found at https://bcide.gitlab.io/post/gop-tax-plan/. We need to focus on territorial tax or resident based tax for individuals. Citizen Based Tax is hurting overseas Americans. Also, we need to get FATCA repealed. Do you think you can deduct 40K as an itemized deduction for work related education?